The People Smuggler: the true story of Ali Al Jenabi, the ‘Oskar Schindler’ of Asia; by Robin de Crespigny. Winner of the 2012 Queensland Literary Awards and shortlisted for the Walkley book Award. Front cover of The People Smuggler. Image: Seen from the back a young boy holding a stick runs along with a tire rolling in front of him, down a wide dusty street with traffic on either side flanked by tall houses and shops. So not initially a saint, but all the same a man who came to see his employees as people needing his assistance, and in the end at great personal cost to himself he saved as many of them as he could. Not as I had thought by smuggling people out of Germany but by bribing everyone he could, including SS Officers, to ensure his employees remained safe. Years later this story would parallel, in many respects, that of Ali Al Jenabi. A story which I only knew snippets of from media reporting of his trial in Australia, post Tampa and stories from Villawood Detention Centre. The book is divided into sections detailing Ali’s time in Iraq, Indonesia and Australia. Ali Al Jenabi’s story begins in Iraq under the oppressive regime of Saddam Hussein. I spent much of this portion of the book wanting to believe that the story told here was embellished. While I’m sure there are areas that were brushed over or perhaps forgotten since this book was started over a decade after the end of that period of Ali’s life, the details are too real to be made up. Also, as I reminded myself later, there are plenty of periods in history and currently that serve as reminders of how awful people can be to one another. The atrocities of the Saddam era are well known, seeing them personalised is really something else. I won’t go into the details of how Ali manages to get to Indonesia and tries to organise to get on a boat to Australian territory where, like many others fleeing Saddam he can seek asylum. I urge you to read the book. Once there he pays the first of many bribes. I found this section really frustrating, again for reasons I won’t go into, because *spoilers*. It wasn’t until I had been turning my frustrations over in my head for a few days that I suddenly wondered how I would go about arranging ‘safe’ passage for me and my family to seek asylum if I were in a country where I didn’t speak the language, had limited resources and had to rely on strangers or indeed if I were in Australia desperate to flee but needing to find a way out that wouldn’t alert the Government to what I was doing. That’s when I started to realise that perhaps I was a bit blinkered in how I was approaching this and that never having lived under an oppressive regime (even though I don’t like the Abbott Government I don’t live in fear of secret police kicking my door down and taking me away to be tortured because I said so) I can’t really judge what others had done in situations I am unlikely (I sincerely hope) to ever encounter. Nor can I assure myself that I would do it differently or somehow be better at it. Once Ali is in Australia I got to cringe at the awful way we treat asylum seekers and this is before Manus so it has only gotten worse. This section of the book doesn’t show Australia in a good light, nor should it. Our handling of asylum seekers is appalling under both Labor and Liberal Governments. Ali Al Jenabi is still in Australia, according to de Crespigny’s website for the book, on a “bridging removal pending” visa which means that as soon as the Government decides that Iraq is safe they can deport him immediately. As far as I know Ali is still living, with this uncertainty hanging over him, with his family in Sydney. There are details of how to write to Scott Morrison on de Crespigny’s website. For me there are still a lot of unresolved issues swirling about this that I can’t quite articulate so I’m still not sure what to feel about this book and about Ali Al Jenabi. One thing I am sure of though, like Oskar Schindler, he saved the lives of many and that can’t be a bad thing. Published by Viking (Penguin Books) 2012. 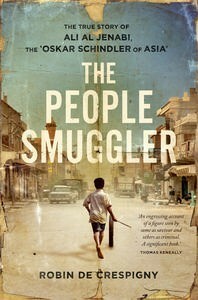 The People Smuggler by Robin de Crespigny is available from bookshops now in print. You can purchase your print copy of The People Smuggler from most book retailers. Or you can order online from Penguin books at this link. I am reading through the Stella Prize Longlist from 2013 for the Australian Women Writer’s Challenge 2014. The list can be found here. I have reviewed The Sunlit Zone, Sea Hearts, Like a House on Fire, and The Mind of a Thief.